Interlock blank needlepoint canvas interlock is a high quality needlepoint canvas that can be used for most projects. Interlock needlepoint canvas is best used for continental or basketweave stitches, rather than stitches that might require movement at the canvas thread intersection (where mono canvas should be used). Interlock canvas is lighter and easier to handle than mono canvas and is preferable if your hands have arthritis or are susceptible to pain. Interlock blank needlepoint canvas is available in a variety of mesh sizes. Made by Zweigart, the leading needlepoint textile manufacturer. 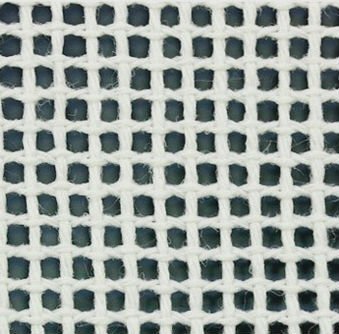 The interlock needlepoint canvas mesh sizes range from 10 to 18 holes per inch. Interlock needlepoint canvas is 40" wide. It is a single weave canvas. Sold in uncut yard lengths. We can ship your blank needlepoint canvas rolled or folded. The cost to ship it rolled is higher so please select accordingly. Rolled shipping is not available for international destinations. Contact us with questions about blank needlepoint canvas.